What changes make the 2019 Audi Q7 different? Maybe innovative toll-payment technology, and hopefully, a more liberal approach to safety-feature availability, but no changes to styling or engineering are expected until model-year 2021. That leaves the 2019 version of Audi’s appealing seven-passenger crossover in a holding pattern while the German automaker prepares to surround it with some intriguing home-grown competition. All-new for model-year 2017, this second-generation Q7 helped the German brand usher in its next era of design using sharper-edged bodywork and lighter-weight structures. The 2018 Q7 received some minor equipment updates that’ll carry over for 2019. Unchanged was Audi’s policy of reserving driver aids like adaptive cruise control and lane-maintaining automatic steering for the most expensive trim levels, and then only as part of a pricey option package. We urge Audi to alter that for the ’19 Q7. To see whether Audi loosens its policy on driver-assist-technology; see “Should I buy a 2018 Q7 instead?” below for details. You might also wait to see how it might shuffle some features. Among features it could add is its just-introduced Integrated Toll Module, a toll transponder built into the vehicle’s rearview mirror. Adding convenience and cleaner aesthetics, it would take the place of stand-alone toll transponders. Audi says it can interact with toll systems and high-occupancy-vehicle lanes in the U.S. and parts of Canada and Mexico. Drivers can adjust the module’s settings through the vehicle’s infotainment interface. Regardless of any changes in available features, the ’19 Q7 lineup will reprise Premium, Premium Plus, and top-line Prestige trim levels. Expect the Premium and Premium Plus grades to again offer a turbocharged four-cylinder engine within the 2.0T range, or a supercharged V-6 to create the 3.0T range. The Prestige should again be limited to the 3.0T range. All models will return with Audi’s quattro all-wheel drive (AWD) as standard. Waiting for the ’19 almost certainly means absorbing higher asking prices for what’ll be fundamentally an unchanged vehicle. It will also, however, position you to audition new Audi crossovers due in showrooms during calendar 2018 and ’19. The Q8 will be a five-passenger fastback mutation of the Q7 that’ll be available as a plug-in hybrid. More intriguing will be a pair of all-electric crossovers, each with a promised 300-mile-plus range and 400-plus horsepower. Aimed at the likes of the Tesla Model X and Jaguar I-Pace, the tentatively tabbed “e-tron crossover” would be sized between the Q7 and Audi’s compact-crossover Q5, while the “e-tron Sportback” would be lower-slung and more coupelike. Each would furnish AWD via an electric motor powering the front wheels and one at each rear wheel. Little reason to wait, especially if you’re in the market for a Premium Plus or Prestige model and, being safety-minded, can afford the option required to round out your roster of driver assists. Credit Audi with equipping every ’18 Q7 with autonomous emergency braking that can stop the vehicle to avoid a frontal collision. Unfortunately, adaptive cruise control to maintain a set distance from traffic ahead – even in stop-and-go driving — along with lane-departure warning and lane-maintaining automatic steering, are available only on the Premium Plus and Prestige models, and then only as part of the $2,400 Driver Assistance option package. The package also includes automatic high-beam headlights. Some might deem the Q7 understated to a fault, but there’s no shortage of panache once you climb aboard. The cabin is a model of contemporary design, quality materials, and quiet isolation. Roomy and comfortable, the first two seating rows are exceptionally accommodating. Difficult to access and nearly legroom-free, the third row is best considered seating for kids in a pinch – literally. 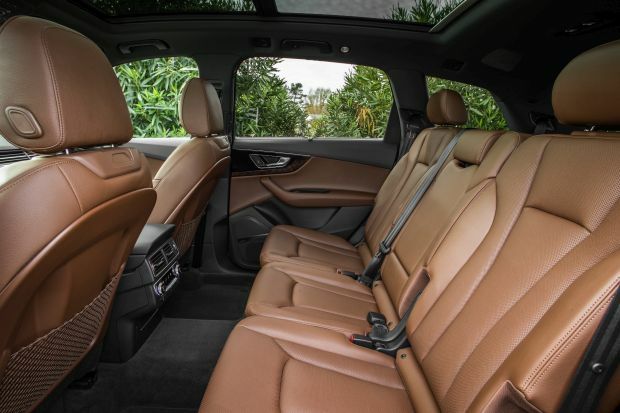 That’s true of most in this competitive set, and the Q7’s cargo volume is midpack, too, at 15 cubic feet behind the third row, 38 behind the second row, and 72 with both rear rows folded. There’s a learning curve with any automotive infotainment system, but Audi’s MultiMedia Interface (MMI) center-console control system is among the most responsive and easiest to use. On 2018 models, it was optional on the Premium grade and standard otherwise; to keep the Q7 competitive, Audi might contemplate including MMI on all 2019 models. 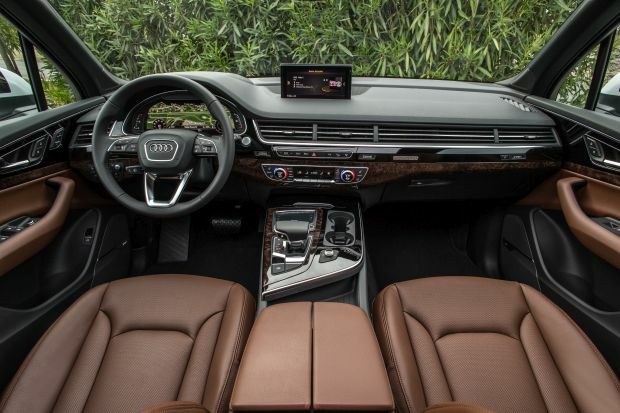 Similarly, it ought to consider expanding the Q7’s Virtual Cockpit instrument display beyond just the Prestige model, where it was standard for 2018. Virtual Cockpit replaces the traditional gauge cluster with a 12.3-inch programmable LCD display. Capable of showing strikingly clear navigation maps and other vehicle info, it’s a neat piece of gadgetry. Highly unlikely, although some reports suggest Audi may be planning a plug-in-hybrid version. With the automaker prioritizing development of the aforementioned Q8 and e-tron crossovers, don’t anticipate any potential electrified Q7 before the model-year 2021 refresh. Do expect the 2019 Q7 to reprise the ‘18’s engines and to again link both to an eight-speed automatic transmission and quattro AWD. The 2.0T range would return with a turbocharged 2.0-liter four-cylinder, likely repeating at 252 horsepower and 273 pound-feet of torque. Lots of rivals employ a turbo four of similar spec, and like them, the 2.0T Q7s deliver adequate acceleration, tempered by slow movement away from a stop that can be mollified somewhat if you ease into the throttle. The supercharged 3.0-liter V-6 in the 3.0T range feels far more appropriate in a vehicle of this nature. It should return with 333 horsepower and 325 pound-feet of torque and although there’s more muscle available in some rivals, you’ll appreciate its strong, smooth pull from most any speed. Sans a performance variant — ala the SQ5 version of its compact crossover — Audi will continue to tune the Q7 for a balance of handling and comfort. Indeed, the ’19 should again emphasize suspension composure and natural-feeling steering and be the better for it. Bump absorption does decline as you move up in wheel and tire size, although only the 21s trigger really intrusive jolts on potholes and other sharp disruptions. The Adaptive Chassis Package available on the Prestige ($4,000 for ’18) includes an air suspension, as well as four-wheel steering, but we don’t find its advantages worth the price. 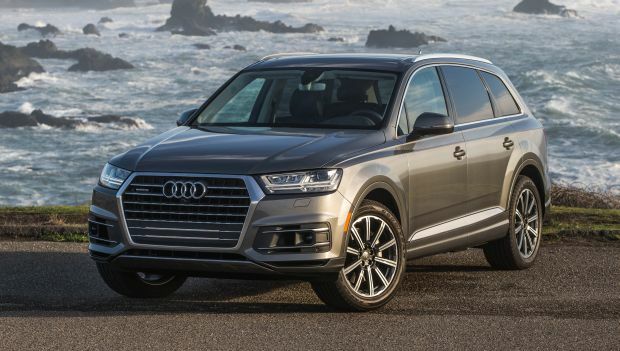 EPA ratings for the 2019 Q7 should be unchanged from those of the ’18 Q7. That means fuel economy on par with premium-midsize crossovers of similar power, although, interestingly, the ’18 Q7’s EPA ratings with either the four- or six-cylinder engine were identical, at 19/25/21 mpg city/highway/combined. That may be testimony to the turbo-four’s need to work fairly hard to motivate this seven-seater. 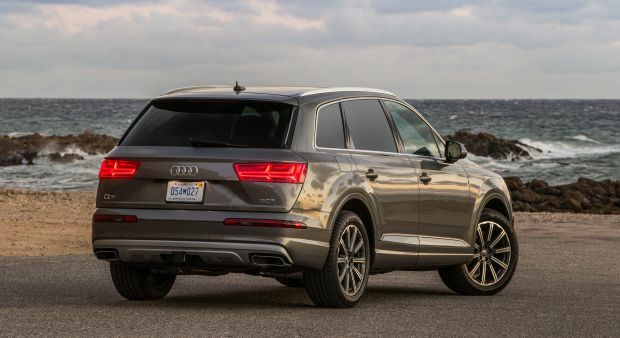 All ’19 Q7s will again require premium-grade 91-octane gasoline. Audi hasn’t announced which of its vehicles will be first to get the Integrated Toll Module. Even if the ’19 Q7 is on the list, it would be one of the few wholly new features expected. The automaker is more likely to shuffle some features – and we’d urge it to begin by reassessing its safety-assist distribution. Otherwise, the ’19 Q7 will return with a satisfyingly comprehensive array of standard equipment, even on the “entry-level” Premium grade. The roster will again include keyless access with pushbutton ignition, leather upholstery with eight-way power heated front seats, a panoramic moonroof, a power liftgate, front- and rear-obstacle detection, and xenon headlamps with LED daytime running lights. Look for ’19 Premium Plus models to again add blind-spot and rear cross-traffic detection, plus hands-free operation for the power liftgate and a Bose-brand audio system. An imbedded navigation system likely will again be standard on the Premium Plus and Prestige trims and an option (at $3,000 for 2018) on the Premium. The system includes Audi connect telematics and Apple CarPlay and Android Auto support. The 2019 Q7 Prestige would again build on the Premium Plus with standard power door closers to their comprehensive standard-equipment list that includes full LED headlights, four-zone automatic climate control, ventilated front seats, rear side-window sunshades, surround-view camera, head-up instrument display, and Virtual Cockpit. Among key options, paint colors other than basic white or black probably will again cost some $575-$3,900. Other returning options available on all models should include a Cold Weather Package with heated second-row seats and a sport steering wheel ($650 for 2018); a Towing Package that on the 3.0T, allows trailers up to 7,700 pounds ($550); running boards ($1,200); torso-protecting rear-side airbags ($350); and a factory-sourced wiring loom that can accept a dealer-installed dual-screen rear-seat entertainment system ($150). Expect many of the Prestige’s standard features to again be optionally available on the Premium Plus for 2019. These would include the Vision Package ($2,000 for ’18) with full LED headlights, the Virtual Cockpit, and a surround-view camera. Under the heading of 2019 changes we’d encourage would be the LED headlamps as standard on all models or as a stand-alone option. The Warm Weather Package ($1,600) would again add to the Premium Plus the Prestige’s ventilated front seats and sunshades for the rear windows and tailgate and four-zone automatic climate control. In addition to the aforementioned Titanium Black Optic and Adaptive Chassis packages, the ’19 Q7 Prestige should return with some exclusive options. These would include the Luxury Package ($5,500 for ’18) with massaging front seats with 18-way power adjustment, Valcona-branded leather, and an Alcantara faux-suede headliner. Also expected to return would be a Prestige-only 23-speaker Bang & Olufsen audio system ($5,000) and night-vision camera ($2,500). As for wheels, the 2.0T range can upgrade to 19-inch alloys from standard ‘18s for $1000 and to 20s for $1,800. Premium and Premium Plus 3.0T buyers can upgrade the standard 19s to 20s for $1,000, and Prestige buyers can enlarge to 21s for $1,000. In place of standard all-season tires Audi should continue to offer run-flat summer tires in the 19- and 20-inch sizes as a no cost option. Given increasing demand not only for this Audi but for virtually all premium-class crossovers, 2019 Q7 prices will almost surely increase. (Note that estimated base prices in this review include the manufacturer’s destination fee, which was $975 on the ’18 Q7). In the 2.0T range, estimated base price is $51,400 for the 2019 Premium and $55,400 for the Premium Plus. In the 3.0T range, estimated 2019 base prices are $57,900 for the Premium, $61,900 for the Premium Plus, and $66,900 for the Prestige. Look for a 2019 Audi Q7 release date during the third quarter of 2018.